Minimize risks of legal and reputational damage with our software compliance audits. Maintain permanent compliance with ongoing license management. You are using an illegal copy of Adobe Professional to read your PDFs? Or a copy of Microsoft office?? Then you should be concerned, because you are setting yourself up for a potential liability and huge financial disaster from the BSA (Business Software Alliance) in a case of a Raid. In a country where copyright tends to blend easily with right to copy, we have taken a serious challenge in educating companies on the value and reason for legalizing their software usage. In the past years, we have helped over 22 large organizations detect the use of fraudulent software in their company, and worked closely with the BSA to obtain a moratorium guaranteeing a period of 3 to 6 months without any risks of raid, giving them enough time to become legal. We are the only company offering and supporting this service in Thailand and we are recognized as advocate for legal software by the BSA themselves. Every day, local companies are raided by law enforcement officials whose sole intent is to find pirated software. Those caught are forced to buy original versions for every single computer in their office and are also hit with a heavy penalty. This amount could exceed a few million baht. Ask yourself "If I received such a fine, could I even afford to stay in business? " If the answer is no, then why even take the risk? 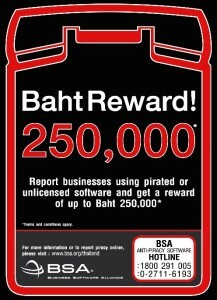 These raids happen because the Business Software Alliance (BSA) gives huge rewards (250,000 baht) to people who report companies using illegal software. Every business owner has a disgruntled former employee or some rival who are candidates to contact the BSA, turn them in and collect their reward. That's the reason why any company is exposed, no matter its size or activity. SafeComs can also prepare your company for certification with Sarbanes-Oxley, ITIL Certification, and Computer Usage and Best Practices. Sleep well at night, there is no risk to get caught by the BSA, no worries about using illegal software or not, we take care of that. We advise to use open source software. Why buying expensive licensed software if you can get them as open sourced? Using illegal software is more likely to fail or malfunction, which in turn can make a mess of your computers and render the valuable information they contain useless. Illegal software is also one of the main sources for computer viruses that can lead to all sorts of other problems for a company. SafeComs regularly speaks at conferences promoting Intellectual property rights, we advise companies on the benefits of using legal software and we help in the process of becoming fully legal without any risks. 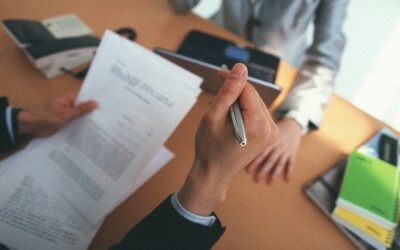 SafeComs is accredited to audit your systems and give you a certificate of good standing for legal software. This certificate is delivered under the SAM advantage program of the BSA and will be recognized by your clients and suppliers overseas in the fair competition program. Bernard Collin also publishes paper on the risks associated with using illegal software, you can download a PDF here. One of our first involvement with the BSA was when a customer called us in a panic mode saying: "We have the police at the door, they are here with a Law Firm and a special Raid Company, they have a warrant to search all our systems, what do we do?" It is worth going back a couple of weeks before when we were discussing legal software with the management of the company who was aware that they had some illegal software installed, had no idea of the size of the problem but had decided to fix it and make sure the company would be perfectly legal. They were just signing some new investors, could not afford a negative publicity, but also were tight on budget and had to wait till the money arrived to make their purchase. We discussed alternatives, however, our recommendation was to run an audit first to know exactly what was illegal and what needed replacement and what budget they had to allocate. We also proposed to negotiate in their name, a moratorium with the BSA to give them enough time without risk, the only requirement was to audit their systems, declare what was illegal and commit to a replacement with genuine software within an acceptable time frame for both parties. The raid performed by a law enforcement official revealed a number of illegal licenses of MS Windows, MS office, and a MS small business server that were needed by the company, however when the whole thing turned to a nightmare is when they discovered that the IT manager decided that it was too difficult to download Acrobat reader (free version) to all 120 PCs, so he installed a cracked version of Acrobat professional (15,000 Baht per user) on each. He was also running a couple of file servers on 2 separate enterprise version of Microsoft. The negotiations with the representative of the BSA were really long and painful, but I will say that I found people prepared to listen and negotiate fairly. They understood the situation of the client and the payment only covered software needed by the company, not the additional ones installed by "careless" employees. If you know you have illegal Software, don't wait; request a moratorium in full confidentiality that will give you a few months to make your company clean without taking any risks.